In one of my previous Chinese New Year dish, I suggested a fish dish as fish sounds like abundance in Chinese. We all want 2016 to be a year of abundance so that we’re happy and there will be plenty of laughter in the home. This brings me to my next dish which is a rather simple and easy dish to prepare and cook: Steamed Prawns with Garlic. 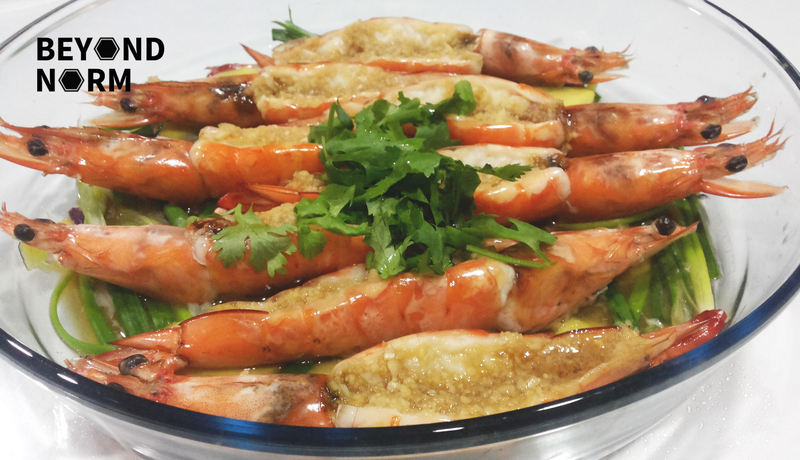 The word for prawns sounds like “ha” in Cantonese and some other Chinese dialects, hence symbolizing laughter (笑 “哈哈”) and happiness. So I certainly hope that if you include prawns in your meals during Chinese New Year, you will have lots of happiness and laughter throughout the year. Let’s have a HAHAHHA year ahead!! If you have enjoyed our recipes, we hope that you could provide us with some feedback / comments either via our blog or by joining our Mummy’s Kitchen Facebook Group. You can like us on Beyond Norm’s Facebook Page to get the latest updates from our blog. 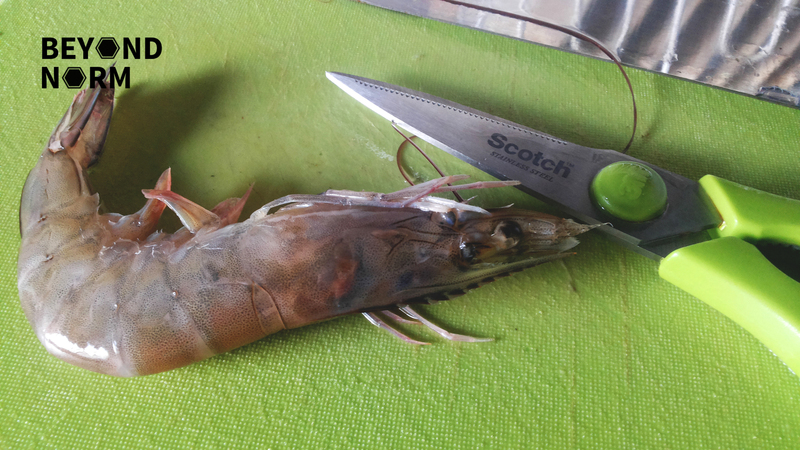 Trim away the whiskers and legs of the prawn. 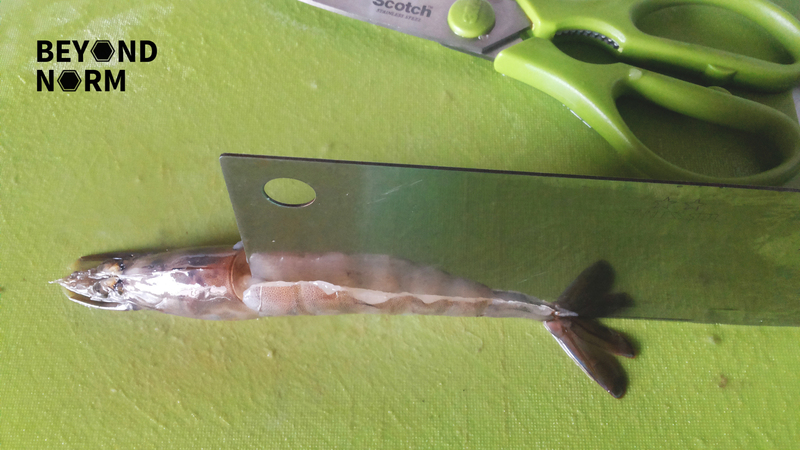 With a pair of sharp kitchen scissors make a small snip between the body and the head so that you can cut through the shell of the prawns. Make sure you do not cut off the head from the body. 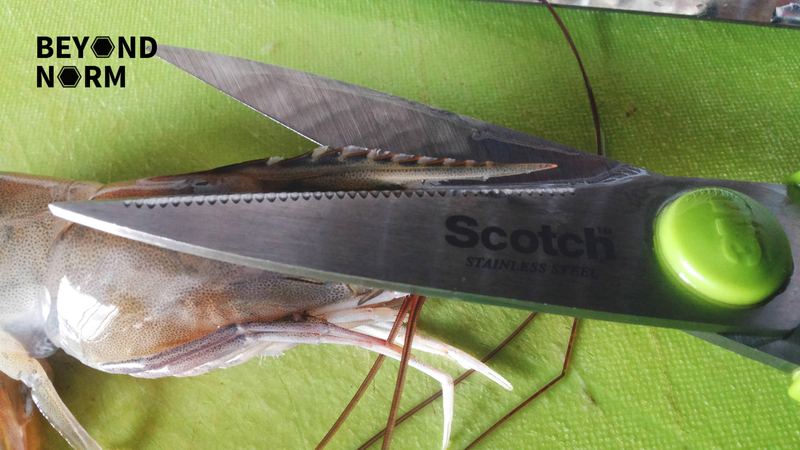 Use a sharp cleaver or knife to butterfly the prawn and remove the entrails. 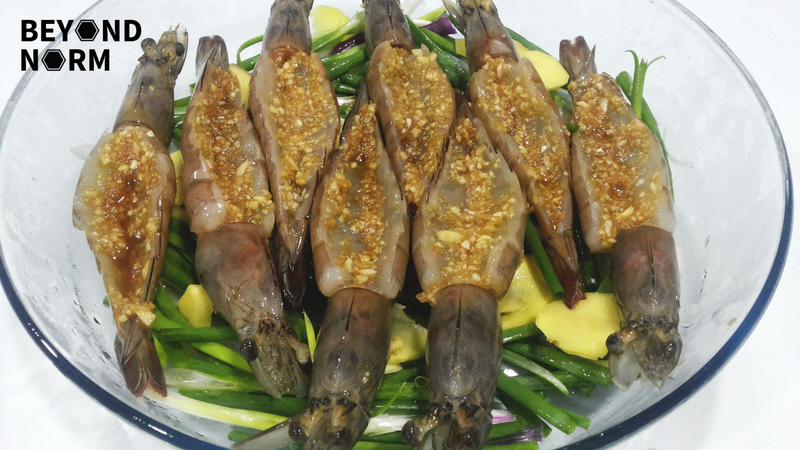 Place the slices of ginger and green onions on a plate and arrange all the prawns on top, making sure they lie in a single layer. Fry the minced garlic with the oil till fragrant but not burnt and set aside to cool. (If you prefer, you can just put the raw minced garlic into the mixture and combine well without frying). Mix the rest of the garlic mixture with the fried garlic and combine well. Set aside. Fill the wok with water and bring to a rapid boil. 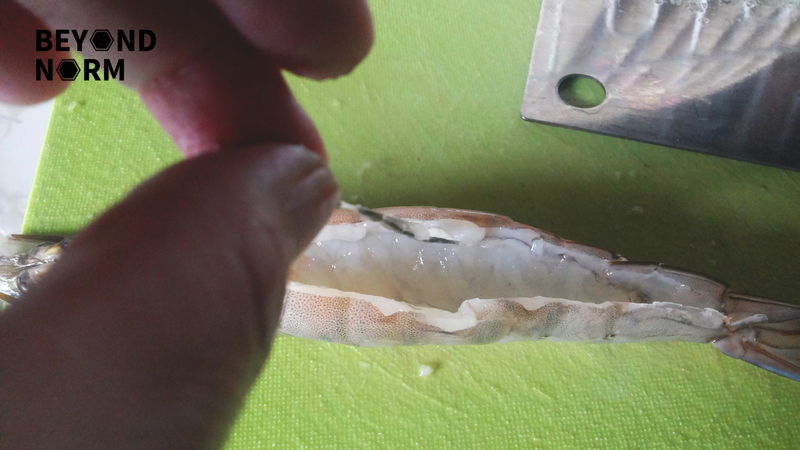 Meanwhile, spoon the garlic mixture into the cavities of the prawns. 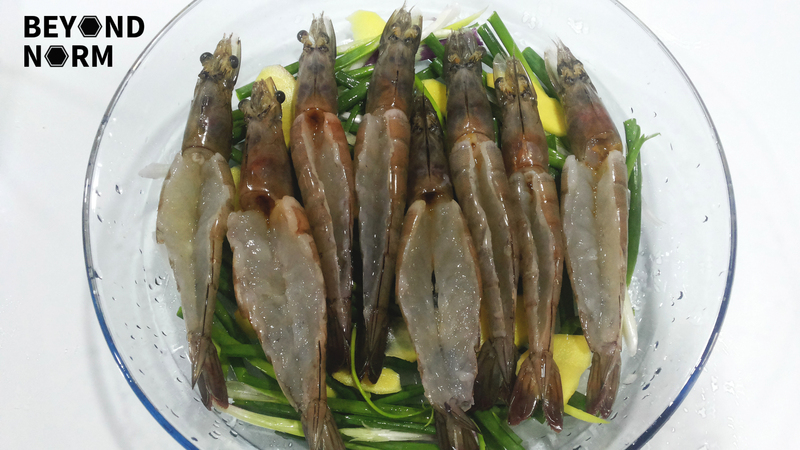 Once the water is rapidly boiling, place the prepared prawns and steam for about 3 to 3 ½ minutes. 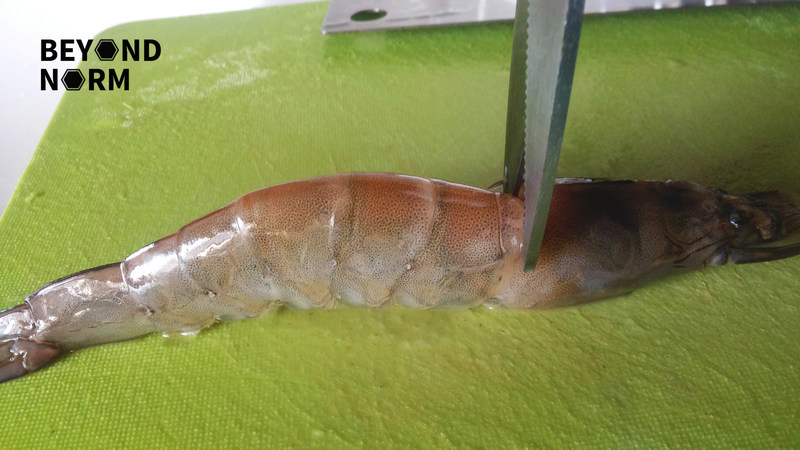 Remember to set a timer as you do not want to overcook the prawns. 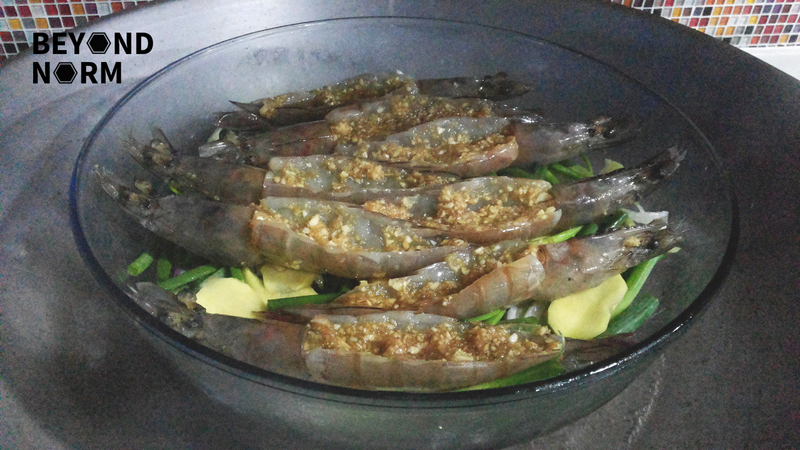 Once the prawns are cooked, remove the plate from the wok. Seasoning is to be adjusted to taste.